….because sometimes you just want a good old-fashioned buttery American-style garlic bread! I was inspired by a recipe that appeared in Cook’s Illustrated a few years ago. Roasting the garlic cloves takes the harshness out of the garlic for a mellower, but still garlicky, flavor. 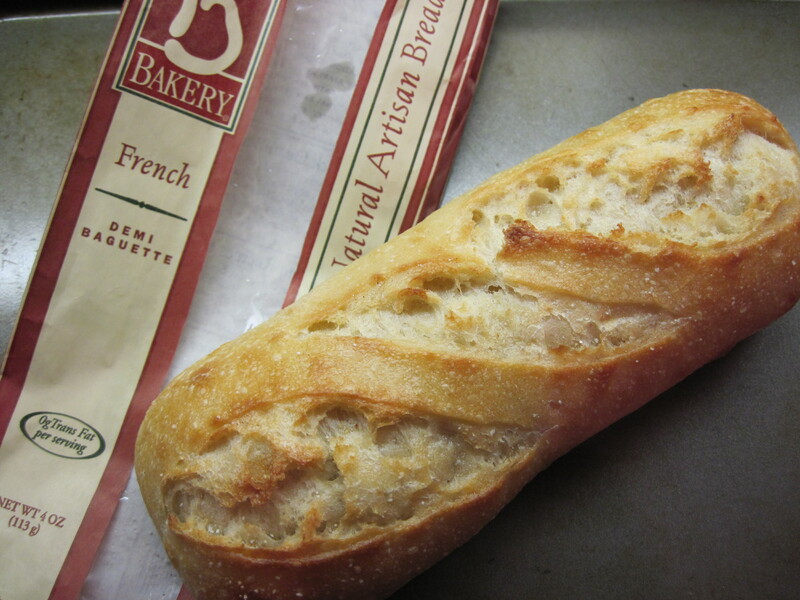 A small (4 oz) Demi Baguette from La Brea Bakery is the perfect size for 2 or 3 servings. I found I had more garlic butter than I needed, so I saved the rest and it was a great accompaniment to baked potatoes the next night. You can double the amount of ingredients for the garlic butter if you want to use a larger loaf of bread. With double the amounts, Cook’s Illustrated suggested a 1 pound loaf. 1. Heat the oven to 500 degrees. 2. 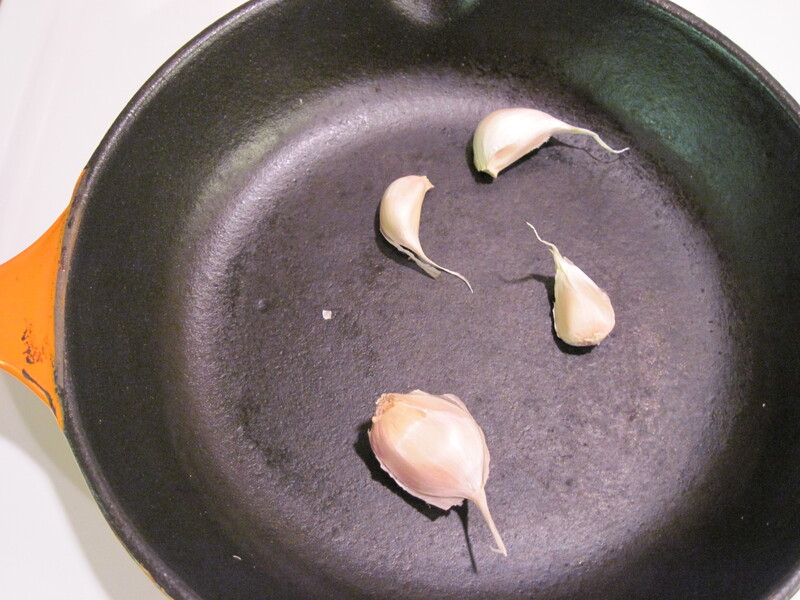 Put the garlic in a small pan and toast, stirring often, until fragrant and the cloves are starting to brown (about 8 minutes). Remove from pan. 3. Mash the butter, cheese, and salt together with a fork. 4. Take the skin off the garlic cloves and use a garlic press to add the garlic to the butter. Mix well. 5. Put the bread on a baking sheet and sprinkle with salt. Bake for 8 – 10 minutes, until golden brown and toasted. 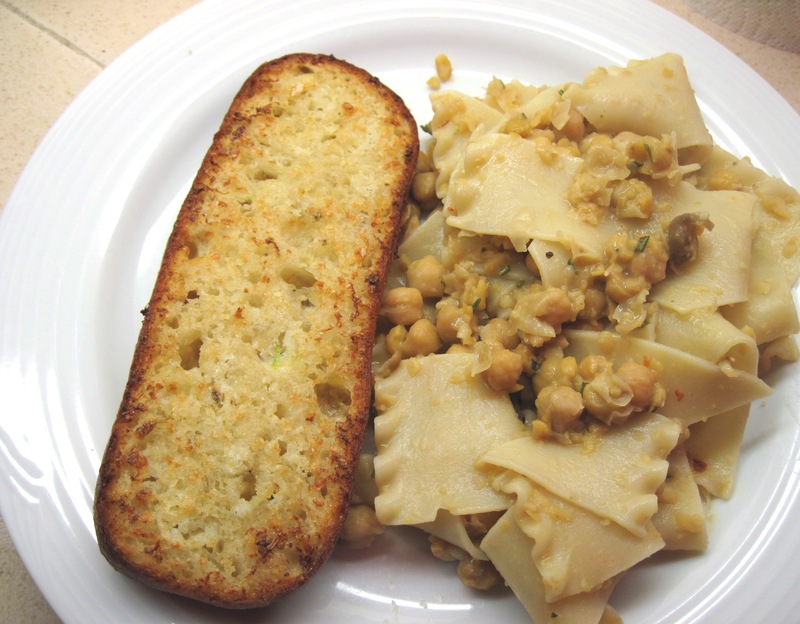 Here’s the finished garlic bread, shown with Flat Pasta with Chickpeas.